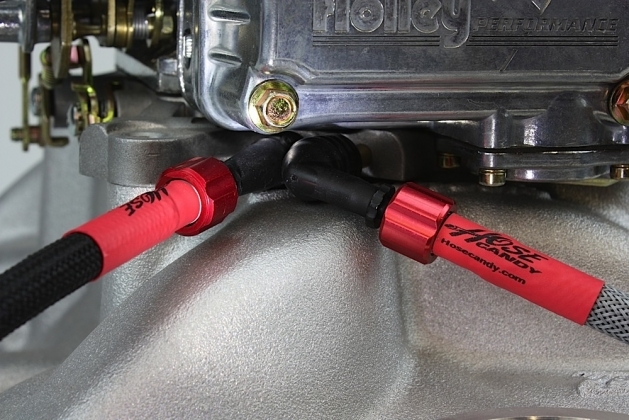 Hose Candy™ has a Patent Pending quick coupler system, known as Sidewinders, that converts any vacuum or turbo hose connection into a quick disconnect. The color coding provides a show stopping look. Installation requires only minutes and half a twist! Hose Candy Sidewinders are available in four kits: Master, Basic and Single Car Kit, as well our Carb Coupler Kits. Each kit is available in 7 colors. The Master Kit includes over 100 fittings to allow hundreds of designs. This comprehensive quick-coupler kit has a special modular design with CNC rotating collars, rubber vacuum and barb adapters, modular snap-lock fittings, elbows, straights, couplers, plugs, reducers, unions, tees and more for all common hose sizes. Turn traditional vacuum or turbo hoses into quick couplers minimizing leaks, making them quick and easy to connect or disconnect and look amazing. Vacuum lines and hoses are almost always overlooked and can be a real source of frustration, because they get hard and brittle over time making them almost impossible to disconnect they will crack on you, giving you vacuum leaks. And of course they look bad. Hose Candy sidewinders allow you to build your hoses with quick disconnects to take all the hassle out of messing with vacuum hoses. Now the kits come with every kind of fitting and adapter and connector that you can imagine, and they've also got these cool anodized aluminum ends in different colors to finish of your hoses and give you a great look. So you have the option now of running your hoses, in whatever configuration that you want. So what you've got here is the convenience of a quick disconnect, the performance of a positive seal, and the visual punch of cool lines and hoses. You've got Hose Candy. Connect and disconnect in a moment with half a twist of your finger and thumb. Transformation. In minutes, Hose Candy will transform the looks, performance and efficiency of your vacuum and turbo hoses on vehicles ranging from $5K-$200K. Just wait ‘till you see the patent-pending hose- end effects. Quick and easy to install. In 60 seconds, you’ll learn the secret behind Hose Candy’s modular assembly and within minutes you’ll be amazed, staring at your first hose transformation. This modular “secret” is what allows us to sell a Hose Candy kit for less than $100, instead of $200-$300. Stacey Demos Oomph! Labs' Hose Candy Quick Disconnect Fittings. This kit is great! The quick connect couplers make it simple to disconnect any of your vacuum lines and they look pretty sweet too! Great product.